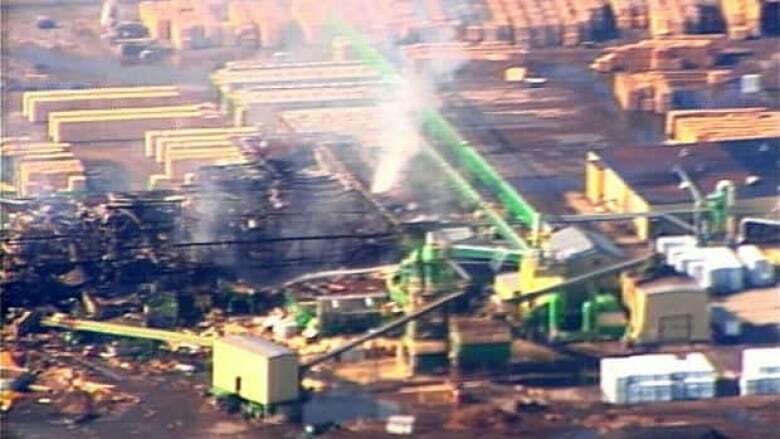 WorkSafeBC has released five years of inspection records for the Lakelands Mills sawmill in Prince George, B.C., the site of Monday's fatal explosion, which indicate dust levels have been a concern at the mill in the past. The 120 pages of documents show inspectors found piles of wood dust throughout the mill as recently as February. The records note that the mill operator was told to prevent the accumulation of "hazardous amounts of wood dust." The cause of Monday's explosion — which killed two men and injured 24 others — is not known, but dust is part of the investigation. Inspectors also flagged wood dust as a concern at the mill three years ago, saying it should be monitored because the wood that was being processed was extraordinarily dry, coming from trees that had been infested and killed by pine beetles. At least one expert has raised the possibility that a high concentration of wood dust in the air was a factor in the Lakeland Mills blast and fire, and might also have been in the similar January explosion in Burns lake, B.C., in January. Industrial hygienist Neil McManus said finely powdered organic materials have considerable potential to explode. Most of the logs at Lakeland Mills were killed by beetle infestation long before they were harvested. About 90 per cent of B.C.’s lodgepole pine has been infested with the beetle. To maximize productivity, sawmills are cutting the dead timber from trees already dead for as long as 10 years. "So is the sawdust finer? Is there a different property in the sawdust that we haven't seen before," asked Stephen Hunt of the United Steelworkers Union. "Without saying that was the cause, it's clearly something that we should concentrate on." Because there are so many unanswered questions stakeholders called an emergency meeting in Vancouver Wednesday. "The order that's coming from WorkSafe, which will go out to the industry tomorrow, asks industry to look carefully at dust — so sawdust — and ask them to look at ignition sources," said B.C. Labour Minister Margaret MacDiarmid. Industry officials say there's no plan to stop cutting beetle-killed pine, however, according to Allen. "That's not practical," Allen said. "What we're going do is take steps to mitigate against any issues flowing from sawmilling beetle wood, including dust." Those steps include better ventilation and reducing or removing sources of combustion. "What we can do now is take some steps to ensure that nobody else is harmed."